The loan-to-share ratio for credit unions is the highest it has been in 20 years, underscoring the need for deposits. The credit union industry’s loan portfolio has grown rapidly in the past five years. Although it is part of the cooperative mission to extend credit, finding sources of liquidity from which to lend has increasingly, become a challenge. 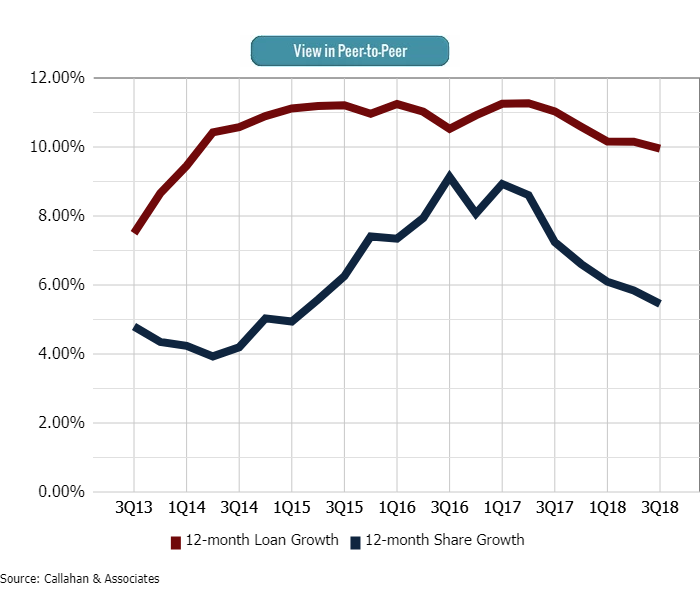 In the third quarter of 2018, the industry’s loan-to-share ratio reached 84.83%. This is the highest it has been in the past two decades. In fact, as of Sept. 30, 2018, 379 credit unions had loan-to-share ratios greater than 100%. Five years ago, 135 credit unions reported ratios greater than 100%. Loan growth has spiked as share growth has slowed, creating a rising loan-to-share environment. 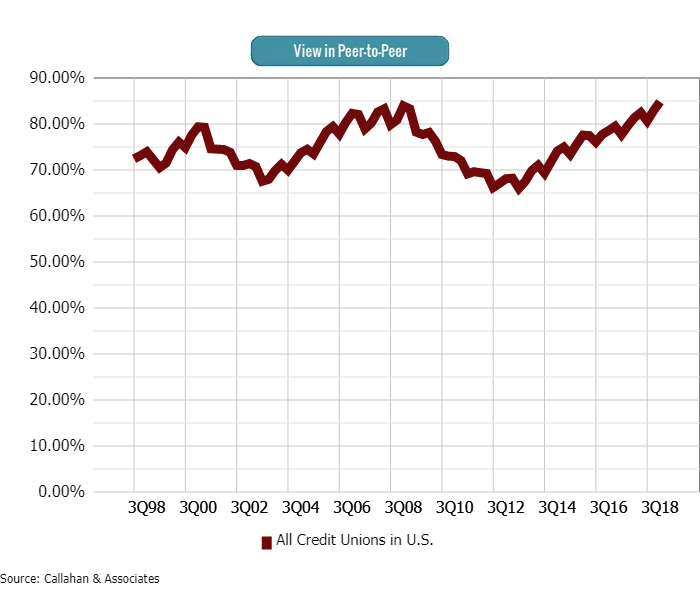 The industry’s loan-to-share ratio is the highest it has been in the past two decades, and more credit unions than ever before posted a loan-to-share ratio above 100% in the third quarter of 2018. Consumers have shown a willingness to take out loans. How they’ll react when they earn a better return on their savings is yet to be determined. What is certain is that rising rates present a wrinkle for financial institutions: Namely, attracting new deposits has become more expensive. The industry’s cost of funds, while still low compared to pre-recession levels, has inched up as the Federal Reserve has increased the federal funds rate. Depository institutions are raising their own account rates accordingly, and credit unions are finding it less advantageous to attract new money in this environment than in a low-interest one. Retaining and expanding the deposit relationships already in place has become paramount. Here are six ways two credit unions have found success attracting and retaining deposits. At 79.6%, Partner Colorado’s loan-to-share ratio is lower than the average for the industry (84.8%), credit unions in Colorado (89.3%), and credit unions with $250 million to $500 million in assets (80.9%). The Centennial State cooperative considers deposits a balance sheet management tool to understand member relationships. Rather than setting goals based on what percentage of its portfolio should come from new money accounts — like CDs and money markets — or retained accounts — like checking and savings — Partner Colorado considers how deposits affect net member retention and net member growth. The credit union hasn’t yet set retention and growth goals for 2019, but it met last year’s member growth goal and core deposits grew by double-digits each quarter of the year. BCU ($3.3B, Vernon Hills, IL) has always been a lending machine, says Brett Engel, the credit union’s director of finance and credit risk management. Its loan-to-share ratio at third quarter, 110%, is just six percentage points higher than its figure from a decade ago. Even so, growing its share portfolio had never been a problem — until 2017. Deposit growth at mid-year 2017 declined to 7% — a sharp downturn from the 15% BCU reported at mid-year 2015. What happened? “As interest rates started to increase, members moved money that had been sitting in lower-yielding products,” Engel say. The change in member behavior most affected BCU’s core deposit products, so to supplement that loss, BCU turned to new-money-only CD and money market account specials. It introduced two short-term, high-yield products (read more below) that helped share growth rebound in the ensuing quarters. Prior to mid-year 2017, Engel estimates 80%-90% of deposit growth came from checking and savings accounts; now, those accounts contribute approximately 30%-50%. As it developed new money specials, BCU paid particular attention to liquidity and yield. It launched a high-yield money market account in late 2017 that offered a 1.75% APY and required $15,000 in new money. Next, BCU looked to its CD offerings — a product not traditionally known for its liquidity. The suburban Chicago credit union knew it had to keep the term short. Enter an 11-month certificate at 2.60% APY. Engel also says the two products combined have brought in nearly $100 million of new money. A few states west, Partner Colorado also found success tapping into member demand, albeit with a drastically different product. The Colorado cooperative is one of a select number of credit unions that offer services to cannabis businesses, an operational focus the credit union identified four years ago. For regulatory reasons this is a complex population to serve, but Fagan believes his credit union does it safely — by limiting relationships to business checking accounts, no loans — and does it well. If we hit our member growth goal, core deposits will follow,” Fagan says. “And if our retention efforts work well, we’ll keep that existing money and it will grow over time. As time has passed, BCU has become more flexible with the requirements to its CD and money market accounts — but not to attract more new money. “We’ve made exceptions as a way to retain deposits,” says Maggie Garcia, the credit union’s senior director of deposit products. During new money promotions, the credit union is often approached by current members looking to take advantage of the attractive rate. And inevitably BCU bends its own rules, knowing that accommodating members is a better business practice than turning them away. “Our growth has been built on the loyalty of our current members" Engel says. "Honoring the rates is rewarding that loyalty and putting the member first." Fagan at Partner Colorado says the cooperative has no secret sauce for attaining or retaining deposits. Rather, front-line staff focuses on individual member relationships, looking for ways in which the credit union can further benefit their financial life. That means building trust and cross-selling only when appropriate. Those are learned skills. That’s why every member-facing employee must complete a consultative selling training program where they learn about conversational and relationship-building skills. With greater need for deposits comes greater competition for deposits, something Engel calls an “arms race.” To stand out from the pack, BCU carefully considers all parts of its marketing messages — from propensity models to emojis. In the case of its CD and money market account specials, BCU built propensity models based on previous deposit activity, among other pieces of data, to determine which members were likely to apply for either product. BCU’s marketing does not take a “spray and pray” approach; rather, it aims to find the members who will find value in each product. For these two products, the best marketing results came from an email that promoted both products at once, says Kim McAuliffe, a senior campaign manager at the credit union. So, what works for deposit product communications? Additionally, BCU tries to personalize its messages by using “you” in the message, as if the credit union is talking directly to the member, and has found success writing subject lines in the form of a question. Finally, BCU isn’t afraid to try new things. If something doesn’t work, it tries something else. And what is an example of something that hasn’t worked for BCU? The credit union industry’s loan-to-share grew to 84.83%. Pull data comparing your credit union’s deposit metrics versus local and national peers in Callahan’s Peer-to-Peer. Let us show you how.